Recently, we compiled a summary of our ministry work for our organization’s annual report. As I went through my calendar entries and photographs from the past year, I was amazed at how easily things unfolded for us. It was as though the plans were already in place, and the only requirement for us was to participate in them. Imagine that. I also re-read our annual report summary from last year. One year ago, we were still finding our feet, praying about and for ministry opportunities and getting plugged in with the local Christian community. Today, we’ve found confidence in being able to live in Tokyo as residents, established several new ministries within the context of our new home church and have a diverse network of contacts within the community whom we can serve and be served by. Best of all, the work we have been doing has led us down the path of helping to plant a new worship service at a nearby school in the coming year as well as hosting what will likely be a very large scale English Summer Camp this coming August with a new church partner from California. Both of these things align with our overall vision of serving the community around our church and reaching the many children and young families around us. We have truly been blessed by consistent financial partners this past year and have had full support pretty much continuously since we arrived in Japan 16 months ago. But we are prudent enough to realize that we may not always enjoy this level of support and we will need a reasonable savings in our ministry account to ensure we make it through the more challenging times. If you are so led, would you consider a one time gift or new financial partnership with us in our ministry here in Tokyo? Instructions for supporting us can be found on this webpage. By the way, though our annual report will be published by JEMS, our sending organization, and emailed to our church partners, if you are interested in personally receiving a copy of our report, please leave me a note in the comments and if we have your email address, I will send it to you. As always, we are grateful for your prayers, your encouragement, your financial support, and your love for us in Christ Jesus. We love you! We have been in Japan for a week now, but it seems longer. Thanks to the help of wonderful friends, old and new, we have been able to accomplish much in terms of getting settled into our new home. We now have official residency in our city, health care, child welfare (it seems everyone gets this in Japan, regardless of income level), a bank account, mobile phones, bicycles (as seen above) and a pending installation of home phone and Internet service. Each one of these things has been an investment of time and effort from a friend on our behalf. As I mentioned in an earlier post, getting things done here take quite a bit of time. If the old adage for America is “Measure twice, cut once.” the Japanese equivalent would be “Measure 10 times, cut once.” Japanese quality is legendary, but the price of getting things done right the first time is a quagmire of process and rules. As our friend explained to us, “Japanese people seem to find emotional comfort in following the rules.” Well said. This past Sunday, we were able to attend the church we will be calling our own, Biblical Church of Tokyo, for the first time in five years. Though our friends the Nakamuras were out of town, we were able to spend time getting to know Kathy, who co-pastors the church with her husband Seiji. We learned about their strategy for reaching the community around the church which is unusual in that the population is growing by birth where the vast majority of Japan is the complete opposite. We feel confident that God has provided us this church as a place to serve, be spiritually nourished, and to learn how to be effective ambassadors of the gospel to Tokyo. Our friend John G. came over for dinner last night. It was a great time to catch up with him personally and hear about the many things he’s involved in. Since he lives just a few stations down from us, we plan to get together with him as often as our schedule’s allow. John told us about some of the local churches and movements going on around Tokyo and he will be a great help in getting us connected with them. He’ll also be joining us for a couple of days when we meet our team from California in Chiba in a couple of weeks. This weekend, we will attend a conference for the 4/14 Window Movement Japan. This is the movement that is forming around evangelizing the age group between 4-14 years old and teaching them how to share the gospel with their peers and families. Less than 50% of traditional Japanese churches have any kind of ministry for children, meaning most children have minimal exposure to the gospel and therefore little interest in hearing about it later in life. With our interest and experience in ministries like VBS and orphanage outreach, we hope to be able to contribute as well as learn from this group. And of course, we are excited about meeting our team from California in Chiba later this month to help with VBS and outreach at two children’s homes, including one for special needs children. We’ll spend 3 weeks out there, 2 weeks with our team and an extra few days to catch up with our friends and fellow ministry workers in the area. We’ll be in no hurry to leave the cooler Japan coast for our home in inland Japan where August is brutally hot. That’s all for this week. Thank you for lifting us up in prayer during our transition; we definitely know we are in the loving hands of the Lord! My first full month with WCF has flown by and I have seen how God has been working in every area of the ministry. I have been careful to start each day in Scripture and prayer, something I was not always so consistent with in my former career. I feel this consistency has allowed me to better hear God’s leading through the Bible and given me tremendous peace of mind as I navigate unfamiliar waters. The World Christian Conference, our key annual event, will take place in less than two weeks, from February 17-20 at Redwood Christian Park in the Santa Cruz mountains. By the power of God alone through prayer, we saw our registration numbers quadruple in just over a month. God turned our worries into joy, and now we celebrate the 230 attendees whom the Lord has called to WCC this year. 94 of these individuals are first time attendees, 2 are coming from Nigeria and another from Mongolia. We are so excited to see so many new faces this year! Prayer: Please join us in prayer for these individuals, as each comes with their own unique circumstances and attitudes about missions. We pray that God will speak to each person and inspire them in their missions journeys. We pray for the health and safe travel of each of our speakers, leaders and conferees prior to and after the conference. I had the privilege of attending a three day conference on Volunteer Ministry Development in sunny Orlando with one of our WCF Board members in January. This conference, put on by Newell and Associates, is a fantastic resource for Christian volunteer ministries as it truly focuses on applying biblical principles to your ministry. I was able to learn so much from this training and I felt it was a blessing for me to start my tenure with WCF in this way. Apart from the excellent training, I had a chance to spend a lot of time with one of our Board Members, Pastor Brian Leong. We got to get to know one another much better and share ideas about the organization. Brian is a fellow Oakland A’s fan, so I knew he’d be a good guy, but now I know him much better and I’m really happy to be able to work with him. From the training and discussions with Brian, I have started working on some strategies for building momentum in WCF over the next year. Due to the resource intensity of hosting the World Christian Conference, we won’t start discussing these strategies with leadership until after the conference, but I have spent a lot of time praying over these ideas and discussing them with some of our Board members. I have also been attending our four regional prayer groups in Fremont, Mountain View, San Francisco and our new South Bay group. It has been a wonderful time to get to know members of our community as well as our volunteers. Prayer groups are an important piece of the WCF ministry, giving people a place to share, encourage one another, and of course pray for missions, missionaries and each other. Prayer: Please pray for smooth discussions and implementation of these strategies over the next few months. Change is never easy and we want to affirm the important contributions of our current leadership team while at the same time accepting that some changes are necessary to move the organization toward our vision. The true blessing is that WCF is an organization full of passionate, capable people who are truly seeking after the Lord’s heart and we know that is something that will not change. I have also been very active with the other ministry activities that I have been involved in. I have started a conversation group with International Student Fellowship once per week, meeting one student (for now) over lunch for conversation time. I also attend ISF meetings and events on a weekly basis. ISF is a practical way for me to do missions work without moving overseas and it has been a great way for me to meet some wonderful people, both volunteers and students. I remain active with our church’s Missions Committee and we have found the level of activity going on in Missions at our church continues to grow. Praise the Lord that missions is a growing part of San Lorenzo Japanese Christian Church! Next month, as part of our partnership with Daisuke and Cheryl Ikegami of Young Life Japan, we will be hosting a Japanese student for about a week as part of an annual American homestay program that the Ikegami’s organize. The student, Jib, who will be staying with us is no stranger to us. 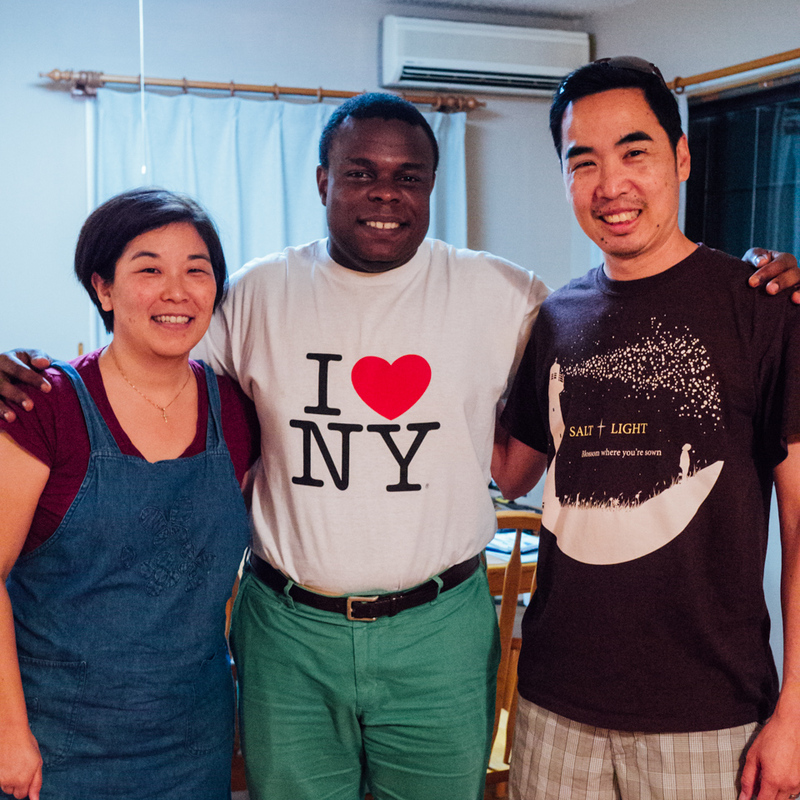 We met Jib on our mission trip to Chiba in 2010 where he participated in many of our events. We are grateful to have Jib stay with us and introduce him to life in California, if only for a short time! Prayer: Please pray for the relationships we will be building with Jib and the students of ISF and that we may be able to show them God’s love through our relationships with them. Pray for the many important decisions our Missions Committee will be making over the next few months. That I am in the place I am today is a miracle of God alone, but my ability to move forward comes from your support and prayers. Thank you so much for all that you give to me and my family for the ministry of WCF. If you are interested in learning more about WCF and how to partner with me, please let me know and I will send you a prayer letter. My prayer requests will go out in email and through this blog, and financial support can be sent through our website under “Executive Director – support“.